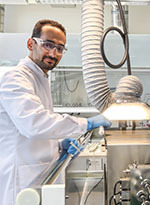 Ramin Ghiyasi is a Ph.D. candidate in Inorganic Chemistry in the School of Chemical Technology at Aalto University with a specialization in nanomaterials. His master’s project focused on synthesis and characterization of layered double hydroxides (LDHs), a group of organic-inorganic nanohybrid materials, with a combination of the experimental and computational method. Along with his academical activities, he has been involved in many innovative industrial R&D projects. Ramin's work in HYCOAT centers on two key terms: ALD/MLD and thermoelectricity. He is currently working on utilization and/or modification of ALD/MLD processes for obtaining better thermoelectric materials.